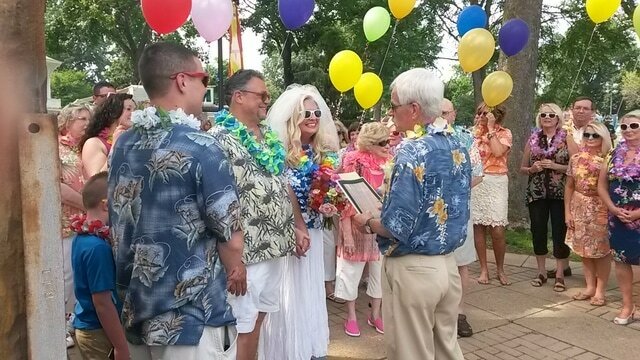 Scott Burkett and Julie Campbell — now known as Mr. and Mrs. Scott Campbell — are married in Gallipolis City Park by friend Randy Allen. GALLIPOLIS — Amidst the hustle and bustle of the Gallipolis River Recreation Festival, Scott Burkett and Julie Campbell joined together as husband and wife in the same spot where they first met — exactly 43 years ago. Burkett and Campbell first met on July 4, 1972, during the Gallipolis River Recreation Festival. At the time, they were 14 and 13, respectively. Burkett, who was from Toledo, was visiting his grandparents for the summer. Campbell lived in Point Pleasant, W.Va. Through a mutual friend, the two met for the first time in front of the Yellow Fever Victims Memorial on First Avenue. Their romance continued for several years through summer and holiday visits, and letters and phone calls. “I remember my Dad would yell at me because of the long distance calls,” Burkett said. As with many young romances, life eventually took new turns and the two drifted apart. Fast forward to 2009, when Burkett searched out Campbell on Facebook and from there regular phone calls and emails rekindled the romance. Burkett proposed on Dec. 24, 2009, in Smith Superstore, where Campbell worked at the time, and on July 4, 2015, the two were officially married in Gallipolis City Park, in the exact spot where they first met. “It made a full circle,” Burkett said. The wedding took place with the support of the River Recreation Festival Committee and Gallia County Chamber of Commerce.